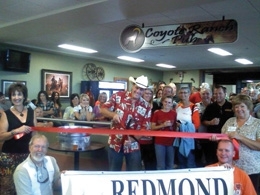 After a few false starts, departing travelers at the remodeled Redmond Airport finally have a new spot for some pre-flight relaxation with the launch of the locally-run Coyote Ranch Pub – the first such facility to be located within the terminal’s secure area. The recent $40 million airport expansion increased the terminal’s size from 23,000 square feet to 140,000 square feet, but changes had left a vacuum for food and beverage following the disappearance of the former ground floor Hangar restaurant. through the typical public Request for Proposal (RFP) process. When the proposal criteria was subsequently more widely circulated, Shurtleff was the successful bidder for an opportunity geared towards the secure area on the upper floor accommodating ticketed passengers waiting to board their flight, though discussions are also continuing with other operators regarding a possible coffee shop and pizza outlet presence on the lower level on the non-secure side. Once selected, Shurtleff oversaw the project via his own construction company, Architectural Specialties, Inc. – which was also involved in the design, sales and installation of the sweeping glass and handrail system accessing the upper waiting area – and the project was completed in a speedy two-month timeframe as crews worked non-stop to get the operation up and running. After a recent grand opening, the pub is now serving breakfast, lunch and dinner including Coyote Ranch’s popular ribs and appetizers, as part of a menu featuring quick meals — including salads and sandwiches — as well as a variety of beers on tap. “This is a little different from the downtown restaurant as food has to be cooked quickly because of the traffic having to get through the airport and on their flight,” said Shurtleff. “The whole idea is to provide something that caters to the traveling public coming through this airport in an expedient and cost-effective way. “Also, there were no hard feelings between us and the Deschutes Brewery. I think they were stepping up to help but when I went forward Owner Gary Fish and General Manager Mike Cooper were very helpful and Gary was even good enough to share his business plan. “City Manager David Brandt and Airport Manager Carrie Novick have also been wonderful to work with and we had a lot of help in, for instance, fast tracking the permitting process. Shurtleff said one of the biggest challenges of the project was bringing utilities to the space – which had previously been designated for a children’s play area – including elevating and connecting plumbing some 50 feet from the ground floor. He added: “We started from scratch and needed to do everything from drop the ceiling to sheet rocking as well as redirecting plumbing up a significant extent. Redmond Plumbing did a great job in that area. “The pub has been well received so far and I think people are really happy to have something to do while waiting for their flight – especially as we offer good food and reasonable prices, which is something Coyote Ranch is synonymous with. The facility has a Western theme and down home feel similar to Shurtleff’s restaurant on Veteran’s Way, and somewhat in keeping with the area’s pioneering origins. The rough hewn stained and stamped concrete top bar is a focal point and Shurtleff hailed a “fantastic job” in that area by Gordon Gribling Construction. A walk-in cooler is also on hand as part of an overall functional and clean operation. Shurtleff said he has long thought the terminal needed such a facility, especially as he is well aware of passenger needs during his frequent travels as part of his work installing ornamental railing systems nationwide. He has worked “hand in hand” with Liver Bronze out of Kansas City in that field for 28 years, with recent projects including work in a five-story Library in Vancouver, WA and Colgate College in Hamilton, NY. Originally from Boston, Shurtleff is also a pilot and has an extensive background in construction, engineering and architecture. He went to school in Arizona and moved to the Pacific Northwest in 1980 before opening up the Coyote Ranch Restaurant – renowned as a steakhouse offering grain-fed beef supplied from Nebraska’s Stockyard feed lots – in 2004. He acted as general contractor on the airport pub project, adding: “It made sense and I did a lot of the work myself along with a great team including many friends and associates. “I treat the place like I own it especially as I have a long term lease with multiple options. “The City was looking for a solid concessionaire committed to looking after their passengers for the long haul. It is also an advantage that I can also cross-promote our other location. “A lot of folks wanted a local business to be involved and are pleased to see us here, employing Redmond people. “We also offer amenities such as two TV screens so passengers can watch the business news or a sporting event. “Another new development is that we recently petitioned the Oregon Liquor Control Commission (OLCC) to allow us to serve alcohol from 5 a.m. rather than 7 a.m.
“I just presented our case and got word that we have received an initial OK which means if we get through remaining regulations, we would be the only place in the state other than Portland Airport able to serve alcohol at that time.